We specialize in removing mold stains from wood, and other surfaces. Attic mold is no match for our products. We utilize a special biodegradable product that removes mold stains quickly and effectively. Once the mold removal process is complete we apply a borate application to protect and preserve the wood. 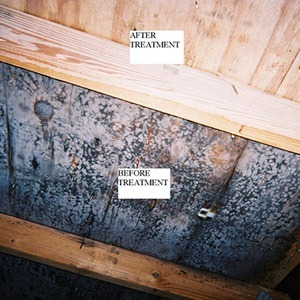 This process fits in perfectly with our mold remediation procedure because we are licensed to apply this product. Most companies in our region are not Licensed to apply these products. You have to be certified in New York State to apply Borate care with Mold care. Not only is this one our favorite natural product for termite Control it is for Mold control as well. Learn more about borates. Mold removal is a multi step process. 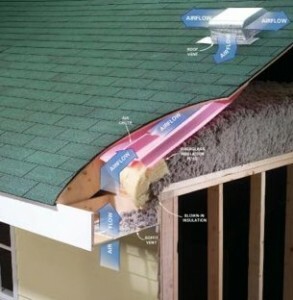 This process entails fixing the current conducive conditions causing the mold to grow. Once the mold is removed the next step would be to protect the wood with borates. If this service is done in an attic space the infested insulation can then be removed and new blown in Pest control insulation can be installed. 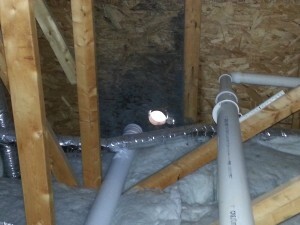 If a vapor barrier needs to be installed in your crawl space we can provide this service as well. Is your home riddled with mold through out? Is it in need of a full or partial gutting? We offer these mold removal services as well. The fungus is truly among us! Oh, we may joke, of course, but mold can be serious business, particularly if it’s growing inside your home. Mold can grow on just about any moist surface. It reproduces using spores, which are carried along by air currents until they land on a moist/wet spot and, unless the wet spot becomes dry, mold can grow. In fact, mold can grow between the floor and any flooring material on it (carpet, laminate, etc.) due to undetected humidity. Building materials such as drywall, plywood, furring strips, carpets, carpet padding can be food for mold. Cellulose and invisible dust can be food sources in carpets. Should your walls suffer water damage, mold can grow inside them and stay dormant until a second instance of high humidity, which is why mold can “suddenly” appear months or even years after a flood or water incident. Time to grow. Although mold can start growing within 24 hours or 10 days. Mold often grows inside buildings and, while most molds don’t harm humans some of the mycotoxins can be harmful. What’s more, molds produce a strong, highly identifiable and unpleasant smell. If you find that your home tends to have mold problems at certain times of the year, it may be because it is either too drafty or airtight. Mold tends to grow in the warmer months in airtight homes (when the humidity levels inside tend to rise due to trapped moisture), but grows more frequently in the colder months in drafty homes because warm air condenses. If you operate artificial humidifiers in the winter, be aware that they can generate an environment advantageous to mold growth. The best temperatures for mold growth are 77 to 86 degrees F (although some mold can grow in air as low as 32 degrees or as high as 95 degrees. Remove just one of the three things mold needs to grow means you can eliminate or reduce new mold growth: moisture, food, warmth. For more information on how we assess the presence of mold, check out our mold assessment page.